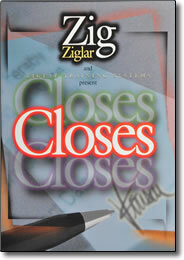 Closes Closes Closes – DVDs by Zig Ziglar – Free Video Clip – Discount! Join Zig Ziglar, America’s foremost expert in sales motivation, as he reveals his most effective closing secrets in this dynamic audio/video sales series. Closes, Closes, Closes features Zig in front of a live audience as he demonstrates numerous sales closes described in his best-selling book, Secrets of Closing the Sale. This power-packed set will prove to be a valuable sales training tool as you learn the “how-to’s” of sales closing techniques from the master closer himself. In his own memorable way, Zig demonstrates creative closes that you can adapt to any selling situation. And many more—over 40 Closes in all! Whether you’re a newcomer to the “proud profession” or a seasoned veteran, Zig tells you what you need to hear in a way that you want to hear it. With homespun humor and proven techniques, Zig guides you to a more fulfilling sales career with practical tips and sales tools to assist you in becoming a more complete and successful sales professional. The complete package includes 2 DVDs, 2 audio CDs, and the paperback book, Secrets of Closing the Sale. The DVDs include subheadings directing you to the specific page in the book where each close is described.